During Ramadan, it is absolutely vital that one eats healthy. Foods rich in fiber, vitamins, and water are truly a necessity if you want to stay full and hydrated. Keeping that mantra playing in the back of my head, I decided to rustle up a good nutritious salad and hearty soup to break my 15-hour fast. Awesome. Now for the assembly. First, cook the quinoa for fifteen minutes in some salted water. While the quinoa cooks, slice your onion as thin as humanly possible and make the dressing. Combine the balsamic vinegar, lemon juice, olive oil, thyme, salt, and onions and let sit. The reason I put the onions with the vinaigrette is that I want the acidity from the vinegar and lemon to cook the onions just enough to take away the edge that raw onions tend to have. 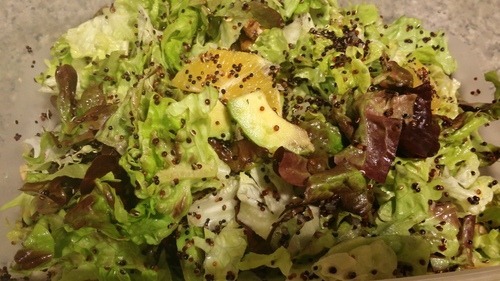 Then, tear up the lettuce in a bowl, cut the orange into segments, slice up the avocado, and add the cooled quinoa to the bowl with a handful of walnuts. This salad is delish! You’re going to love it, I assure you. I mean, what’s not to love, right? You’ve got your crunch from the nuts and the lettuce, your buttery avocado, your sweet orange; I mean COME ON! Give it a go, and let me know how much you loved it!